We make room for entertaining. In terms of today’s custom home theater, the small screen isn’t so small anymore. Now with big screens, wide screens, plasma screens and even projection screens, finding an accommodating unit to house it all can be a bigger feat than the picture itself. At More Space Place you can design a custom built entertainment center that looks like it was made just for your television. Start with the size of your screen. Then expand with shelving and homes theater cabinets to display your movie and sound systems, plus anything else. We know your type well. When the latest technology comes out…you’ve got to have it! Unfortunately, fantastic multi-media centers can create very busy eyesores. Now imagine your custom built entertainment center without a cord in sight. A More Space Place Custom Media Center can help you corral the serpentine maze of wires and blinking LEDs, so you can enjoy your custom home theater without all the distractions. Flat screen TV’s have become a ‘must-have’ in the last couple of years. They are attractively designed with slim lines, can be viewed from larger angles and can be positioned more easily in rooms. The necessity for bulky TV storage is over. Today’s flat screens can hang on the wall and fit in more creative environments, creating a whole new furniture opportunity for monitors and custom built entertainment centers. Thoughtful planning can allow custom home theater units to have the storage space designed specifically for your equipment, including the flat screen TV, TiVo or DVD players. You can neatly hide away wires and cables with our home theater cabinets. Elegant surround sound systems can complement and not distract the big screen TV. The Entertainment Center area is rapidly becoming more of a family gathering place than the family dining table. Why not make sure it is more functional and attractive by designing your very own custom media center that fits your needs? 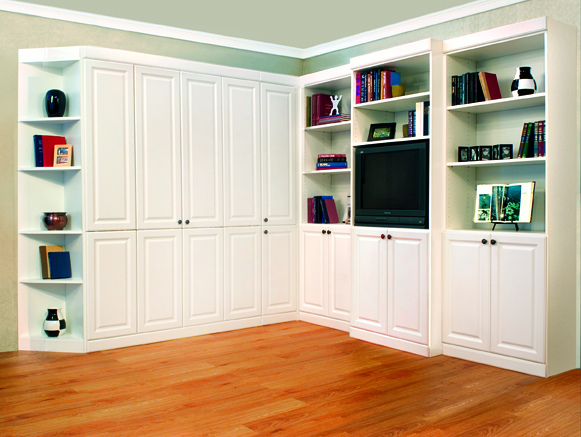 Functionality is the key to a More Space Place Custom Media Center. The stately elegance is almost misleading. Hiding behind the home theater cabinet doors is every gadget you ever wanted. The artful shelving invites you to build your media library. All the electronics and accessories your heart desires can be neatly organized into one classy piece of furniture, custom-fit to your equipment. With dedicated space for all of your components (and then some!) as well as books, CDs and DVDs…at long last, more gadgets don’t mean more mess. Get your custom home theater today! 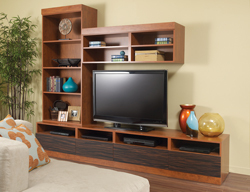 Visit a More Space Place Showroom in your area to create your own custom media center!